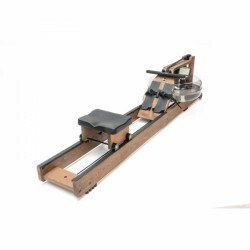 Being a rowing exercise bike (with Watt display), the WaterRower Shadow made of stained ash wood in a black design offers you the extremely realistic water resistance. Thanks to its resistance generated by the water wheel, you train against the natural water resistance, which can be varied via the filling quantity of water. The WaterRower in black "shadow look"! The most natural rowing movement on the market! Thanks to the new wood combination of oak blanc, the original Waterrower is now also available in a white colour versions. 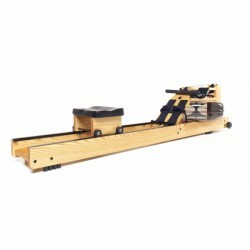 Being made of whitewashed oak wood, this high-quality rowing machine is the ideal training equipment for all users, who attach a great importance to quality and an distinctive rowing experience. Resistance is generate via a water wheel: The stronger the pulling, the higher is the resistance. The actual dynamics of rowing is ideally given. The intensity increases depending upon the speed and you determine naturally and individually the apce. The basic resistance is infinitely variable via the amount of water filled in! 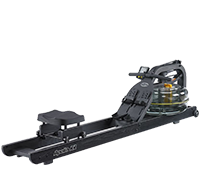 The WaterRower rowing machine A1 is the entry-level rowing machine by WaterRower which on the one hand features totally new elements (e.g. aluminium monorail design), and on the other hand features renowned quality components which premium Waterrower rowing machines are made of. The WaterRower rowing machine A1 beech of WaterRower is a model for starting rowing, which includes completely new components (i.e. mono-rail made of aluminium) and is made of approved quality components of Waterrower Premium rowing machines. Excellent product quality, easy instructions for setup, beautiful product. Excellent product, top quality, easy to mount set-up.. 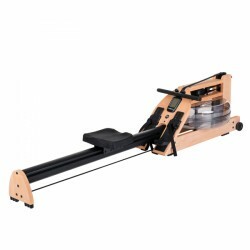 I just bought my first rower. I am must say i am very please with it. Teh quality of construction is excellent, mounting is easy and the water sensation is really nice compare to mecanic weights. It iffers a very good progressivity in the movments , and the design is absoluetly great. The board computer could have been more furbished but insuppose this goes for high models and it includes basic functionalities which should satisfy most of users. Very good product. It's an ultimate aerobic activity! I have tried this machine few year back while on vacation. since then I have dreamed to have it home. It's so useful mainly during winters when you cannot do many sports outside. Amazing product. Cannot say anything bad about it. The movement is very natural. I can recommend this product to everybody. I was a little bit afraid that I as a woman would have problems using it, but it is so easy to learn and workout with it. Good build quality, and easy home assembly. Low noise from the water paddle, so no problem for evening use after the kids have gone to bed. 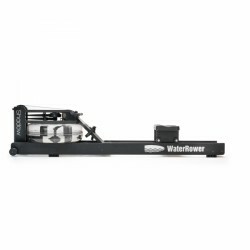 The basic idea of a WaterRower rowing machine is that a rowing machine machine for indoor training at home is provided, which comes very close to rowing on water. Since the development of the first WaterRower (1988) developments and detail solutions of the rowing machine have been continuously realized. Now as ever WaterRower rowing machines areamong the best of its kind. 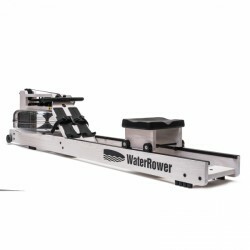 By using water as element of resistance, a WaterRower rowing machine simulates rowing in the open air exactly. The main reason is the use of a patented conic paddle, which generates a soft and very realistic rowing experience in a water tank. In contrast to many other rowing machines, the resistance is varied via the individual pull power of every stroke. That means the more intensively you pull, the more resistance is produced. Thus you determine on your own the intensity of your training with every stroke - like real rowing - either light or heavy. Another advantage of WaterRower rowing machine is the fact that you can hear a pleasant rippling with every stroke. The rowing with a WaterRower is also very close to the sound of the original sport. After a training, the WaterRower rowing machine can be comfortably folded up (without removing water beforehand) and requires just the space of chair in this position. 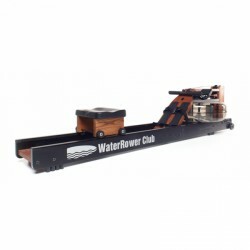 WaterRower rowing machines adapt perfectly to every living environment thanks to their elegant design. There are different design models made of selected natural materials like beech, oak, ash, cherry, walnut as well as metal and stainless steel, so you can choose your WaterRower rowing machine according to your furniture and preferences. 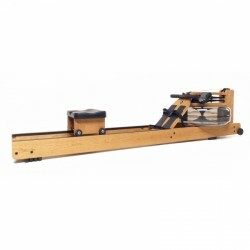 As measured by quality and value of every material, the prices of WaterRower rowing machine are increasing: a WaterRower made of oak is more affordable than a WaterRower made of cherry wood. The A1 rowing machines of WaterRower present the price introduction. 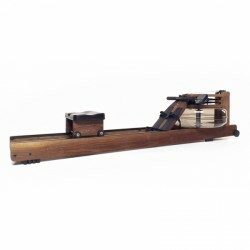 Being made of ash or beech wood, they are mainly designed for beginners and leisure sportsmen due to restrictions in build and training computer in comparison to the original WaterRower.